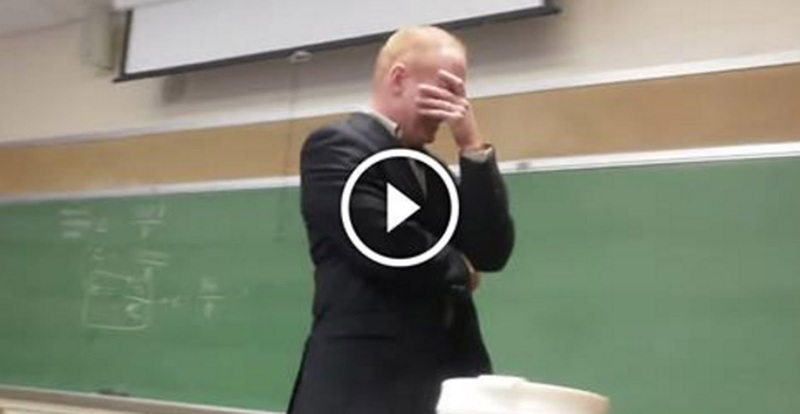 This might just be the most epic classroom prank on a teacher ever! He’s a microeconomics professor at Aquinas College in Michigan and he has a strict policy: if your cell phone goes off during class, you must answer it on speaker phone! This deters most of the students to be absolutely sure that their cell phones are turned off. Well one student left her phone on. And when it rang, she knew the rule – answer it and turn it on speaker so everyone can hear. What everyone hears is something that has the teacher suddenly immersed in deep regret over his rule. What he doesn’t know, is that the joke is on him! He gets totally pranked and he can’t help but react accordingly! Check out his awesome response and this incredibly well done prank!